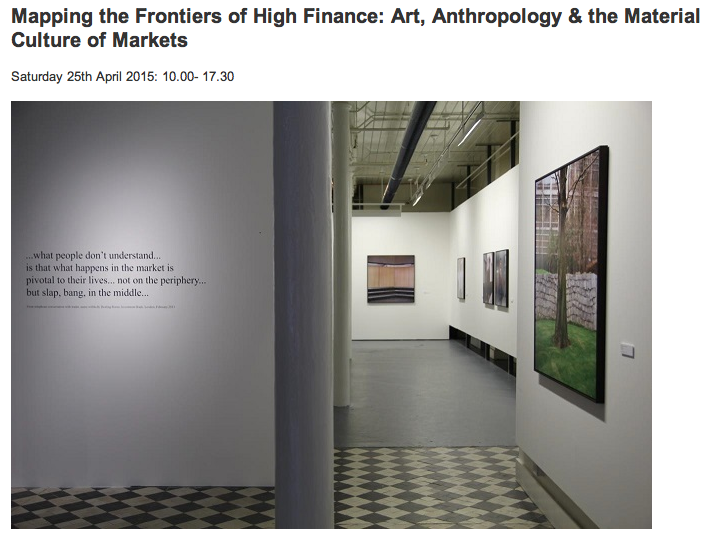 As part of this event occurring at the Royal Anthropological Institute (RAI) in London on Saturday, April 25th, Mark Curran has been invited to present on his practice-led research in relation to THE MARKET. bring together anthropologists, accountancy scholars, literature scholars and artists using anthropological concepts and ethnographic methods in their work…to explore past, present and possible artistic techniques for visualizing information in capital markets, tracking offshore financial flows, and mapping relatedness among financial elites. Other contributors include, Brett Scott (co-organiser), Paolo Quattrone, Femke Herregraven, Paul Crosthwaite, Paolo Cirio, Gemma Aellah & Paul Gilbert (co-organiser). Biographies of all speakers is here. This is a free event and open to the public. Full details can be found here. With support from the Institute of Art, Design & Technology (IADT). You are currently viewing the archives for April, 2015 at THEMARKET.